Apache server is a widely used open source, cross platform web server which can cater to a multitude of needs with its customizable modular architecture. Even with its highly stable nature, it is important for its users to implement a robust Apache web server monitoring system to ensure it functions efficiently and to identify potential problems before they manifest into something big. Applications Manager Apache monitor is a comprehensive Apache management tool which offers agentless monitoring to analyze important metrics, and ensure smooth user experience. With Applications Manager Apache web server monitor, get insight into processes which take maximum time to respond, least time to respond and the average time; find out which servers have been idle and which ones have been busy and stay ahead of issues. See how Applications Manager can meet your Apache monitoring requirements. Schedule a personalised demo. With Applications Manager's real time Apache monitor, set up thresholds for different performance attributes of your web server to receive notifications when they are violated. Alarms raised from threshold breaches instantly notify technicians through e-mail and SMS actions for faster troubleshooting. 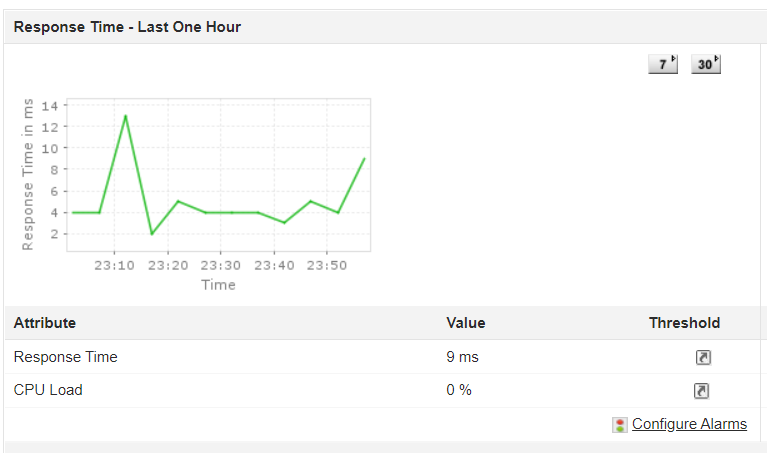 Configure dynamic baselines with Applications Manager's Apache performance monitoring to monitor gradual performance degradation of your Apache web server and stay alert to any kind of deviation from the expected values. Utilize Apache monitoring tools offered by Applications Manager to the fullest and monitor Apache performance metrics with extensive reports for each attribute. Avail performance reports to analyze historical performance trends of various Apache web server parameters. Applications Manager Apache monitoring software tool delivers insight into the performance over a period of time, and uses machine learning techniques to forecast growth and utilization trends of your Apache server in the future. With analytical information about web server performance, load distribution and resource planning becomes easier. Make sure that the websites hosted on your Apache server are always available with Applications Manager's website monitoring capabilities. Monitor key performance metrics from various geographical locations using synthetic transactions and ensure maximum performance of not only your web server but also your websites. Learn more about Website Monitoring.